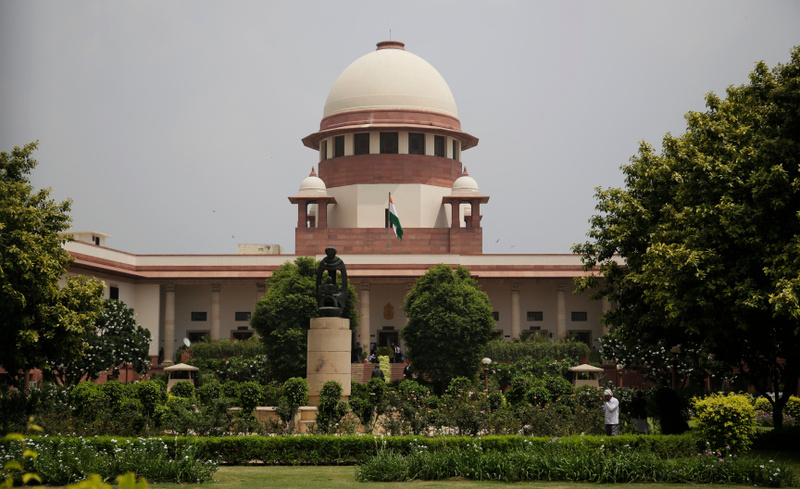 NEW DELHI (AP) — India's main opposition parties sought Friday to impeach the country's top judge, accusing him of misuse of authority and acting under government pressure. Leaders of the Congress party and six other parties presented a notice to the chairman of Parliament's upper house seeking an inquiry into Chief Justice Deepak Misra's conduct, to be followed by a vote on impeachment. They also accused Misra of providing false information when he bought land before becoming chief justice. Misra did not immediately respond to the opposition accusations. It is the first time that political parties have sought to impeach a chief justice. The chairman of the upper house, Venkaiah Naidu, will determine whether there are sufficient grounds for a vote by lawmakers on Misra's removal. Troubles for Misra, who is due to retire in October at age 65, started in January when four other Supreme Court judges launched a rare public revolt, criticizing his distribution of cases and judicial appointments. The four judges said they met with Misra and demanded changes, but he refused. The opposition parties allege that some of Misra's rulings have supported the government's stand on various issues. One example they gave was his verdict against an opposition demand for an impartial investigation into the death of a judge who was hearing a case involving the president of the governing Bharatiya Janata Party, Amit Shah. Congress party leader Kapil Sibal told reporters that the notice against Misra was submitted with "a heavy heart." "As representatives of the people, we are entitled to hold the chief justice accountable, just as we are accountable to the people," he said. "Democracy can thrive only when our judiciary stands firm, independent of the executive, and discharges its constitutional functions honestly, fearless, and with an even hand," Sibal said. The lawmakers who signed the notice belong to Congress, the Nationalist Congress Party, the Communist Party of India, the Communist Party of India (Marxist), the Socialist Party, the Bahujan Samaj Party and the Indian Union Muslim League. The possible outcome of a vote on impeachment is unclear, since opposition lawmakers have a majority in Parliament's upper house, while the ruling Bharatiya Janata Party holds a majority in the lower house.